Sometimes we all need a little pick-me-up. That mid-afternoon crash can come at you hard. Or maybe it is an after dinner slump that has you stuck. For several years now, I’ve been using Young Living Essential Oils & have found many of their products to be of benefit to me and my family. One of the things I use my oils for is an all natural energy boost. Below are five of my go-to energy boosters. I am not a doctor or health care professional. Just a mama who is trying to do what is best for herself and her family. That being said, I know I always find value in knowing what is working for other people. Thus, here are some things that have been working for us. I’d love it if they could help you too! This isn’t an oil. It is a little tube you drink down quickly. It is the first thing I grab to take during a midday slump or “brain fog.” It contains essential oils, ginseng, and green tea among other things. What I like about it is the focused feeling it gives me. It doesn’t give me crazy energy like chugging a large mocha, but it gives me a crisp, alert focus feeling that allows me to zero in on whatever the task at hand and tackle it head on. This is also the hubby’s choice for something to pop quick before a hockey game. Diffusing essential oils is a great way to aromatically take in all the benefits they have to offer. 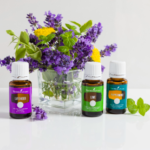 My two favorite options for diffusing for energy are fruity and minty. (I know, I’m great at names, right?) First, fruity. Combine eucalyptus globulus (tea tree), lime, and lemon essential oils. Three drops of each into your diffuser. I love this clean, refreshing blend. I like to diffuse this when I’m cleaning. It gives me energy to clean and the fresh, clean smell is motivation to keep on with my work. I bought this oil awhile back on impulse and it has been a great addition to my collection. It will probably last me forever because my favorite way to use this oil is just to open the cap and sniff directly from the bottle. It is a blend of essential oils that contains rosemary, juniper and lemongrass. 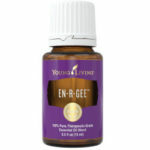 A favorite time of day I use this oil is first thing in the morning. I like to diffuse it in my kitchen while I go about my morning routine and get ready for the day. This is a new one for me. Young Living recently came out with this combination of sparking water, pear and blackberry juice, infused with lime and black pepper essential oils. I liked the taste of it more than I thought I would. In a glass over ice I find it makes a refreshing summer drink. My issue with it has been I enjoy sipping it, which doesn’t give me as quick of an energy boost as I sometimes crave. Still it’s been a fun summer drink to have on hand. My final favorite diffuser blend for an energy boost is my Minty Max. I do three drops of both peppermint and spearmint oil. The burst of minty freshness is a great boost. I love having this going on my desk while I work during the day. There you have it. Five quick and easy things to try the next time you are in need of an energy boost. If you don’t know anything about these products or are looking to purchase, I’m more than happy to help hook you up. Just comment or send me an email. We’ll make sure your next wave of tired doesn’t send you crashing down!